Manufacturing equipment is increasingly instrumented, yet the data that it provides is difficult to link back to the business applications, often requiring expensive and one-off integrations. Oracle Manufacturing Operations Center (MOC) addresses needs for accurate and timely information about product and process quality, insight into manufacturing operations, and performance of manufacturing assets. It solves the complex problem of connecting fragmented disconnected shop floor data to the business context of back office systems. This combination delivers real-time monitoring and analysis of shop floor operations – a foundation for running Continuous Improvement (CI)) programs such as Lean and Six Sigma. Pre-built key performance indicators, sustainability metrics and analytics, delivered in Oracle’s industry leading, easy to configure and extensible Business Intelligence (BI) technology. These unique and differentiating capabilities enable to implement and operate a shop floor intelligence solution at the lowest possible cost, providing a fast return on investment. Oracle Manufacturing Operations Center enables Plant Managers to monitor production performance in real-time through pre-built analytical dashboards and reports. It provides aggregate level analysis on key performance indicators such as production throughput, equipment availability, overall equipment effectiveness (OEE), and production cycle times. 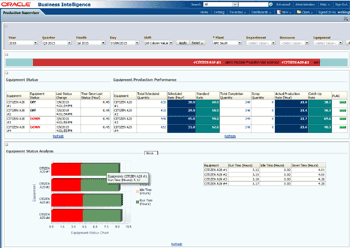 Oracle Manufacturing Operations Center provides pre-built analytical dashboards with key plant performance indicators and many drill downs to seeded reports. Built with Oracle’s proven Business Intelligence Enterprise Edition (OBIEE) platform, it allows users to quickly personalize and extend the dashboards and reports. While sensors and underlying control technology often change quickly, equipment often remains in place for many years. To make better use of existing assets, there is a need for real-time insight into production performance and Overall Equipment Effectiveness (OEE measures asset performance by combining availability, speed and first pass yield into a single key performance measure. Oracle Manufacturing Operations Center helps to monitor production volumes and throughput from anywhere in the enterprise. It is possible to keep track of targets for the hour, shift, day, week or month and monitor production backlog for each piece of equipment to expose bottleneck resources. This provides the right information to take action and increase production throughput. Oracle Manufacturing Operations Center collects production execution data and relates it to plans and schedules in ERP and back office systems. Depending on how to determine service levels, tracking on-time completions or production against customer order shipment dates is most common choice. By providing consistent information to both manufacturing operations and customer facing organizations such as Sales and Marketing, improvement overall service levels are enabled. Oracle Manufacturing Operations Center provides a wide range of options to collect shop floor data directly from Programmable Logic Controllers (PLCs), Supervisory Control and Data Acquisition systems (SCADA) and Distributed Control Systems (DCS). Partner solutions from companies such as Inventcom, Mitsubishi Electric, Kepware Technologies, ILS Technologies and Matrikon Inc. can be leveraged to collect, aggregate and feed real-time sensor data into Oracle Manufacturing Operations Center. Inventcom's worldwide unique software solution CNCnetPDM enables bidirectional connectivity to a broad range of CNC and PC controlled shop floor devices from all well known manufacturers. CNCnetPDM is cost effective and secure as it eliminates the need for additional hardware at the machines or any other changes that could impact functionality or warranty of the device. Due to the fact that CNCnetPDM can entirely be installed and maintained from a remote location it can be implemented rapidly. Mitsubishi Electric offers the MESInterface IT, a hardened factory data appliance that provides secure and reliable connectivity with Oracle Databases and Manufacturing Operations Center. It eliminates integration challenges across Mitsubishi and a range of other brands of factory control systems. MESInterface IT improves system simplicity and maintainability, providing essential functionality such as store and forward data buffering to avoid data loss and a role-based security infrastructure that facilitates effective collaboration. Oracle E-Business Suite™ adapter can provide immediate benefit for a company using Oracle’s Manufacturing Solution. The adapter is designed to periodically collect key master and reference data for objects such as shifts, items, item hierarchies, resources, resource instances(equipment), resource hierarchies, production schedules, production operations, activities, resource instance schedules, resource requirements, material consumed, linked sales order lines and cost. The equipment output and status records collected from the plant automation systems can be processed and interfaced to Oracle EBS as move transactions, completion transactions and resource transactions in case of Discrete Manufacturing and as batch material transactions and batch resource transactions in case of process manufacturing environments. Handling actions based on both internal and external events in MOC, such as sending mobile alerts, e-mails, or calling an external API to initiate the process of creating a maintenance work request. Oracle Manufacturing Operations Center enables the manufacturing companies to gain insight into real-time shop floor performance. Built on ISA-95 reference model, MOC contextualizes the shop floor data collected from a variety of CNCs, PCs, PLCs, SCADA or DCS systems with the enterprise system data and offers pre-built dashboards. Using event management framework, the shop floor alarms and exceptions can be routed to plant personnel in form of e-mails or mobile alerts.